Since November 2015, water climbing has added even more adventure to your Erlebnis-Therme Amadé experience. Daredevils are thrilled by the 5 meters-high climbing wall, right next to the sports pool. This wall features color-coded climbing routes that vary in difficulty. And you do it without a rope! 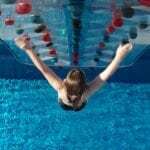 Once you’ve reached the highest handhold, you jump off into the water – if your strength runs out before you get there, you’ll simply fall into the water. Water climbing is a unique combination of mountaineering, aquatic fun and the challenges of diving.